Language Shina, Burushaski, Balti Tibetan, Khowar, Wakhi, Urdu and English. Gilgit-Baltistan (Urdu:گلگت بلتستان) (formerly known as the Federally Administered Northern Areas or FANA) is the northernmost political entity within Pakistan. According to Pakistan's constitution, Gilgit-Baltistan is a self governing region under Pakistan. Gilgit-Baltistan is home to some of the world's highest mountains, including five of the eight-thousanders. The main focus of attention for many travelers is the world's three highest mountain ranges--the Karakoram, the Himalaya, and the Hindu Kush, with five peaks over 8,000 meters and many peaks over 7,000 meters, and having the largest glaciers in the world (other than those in the polar region). Wild rivers and unique landscapes make this area a "mountain paradise" for mountaineers, trekkers, and tourists. Gilgit is the largest town along the Karakoram Highway before entering China. Karimabad is supposedly the setting for James Hilton's book Shangri-La, and the valley lives up to its reputation. Skardu is home to some of the world's highest mountain peaks, glaciers, forts, museums, and resorts. Fairy Meadows is the point where three world-famous mountain ranges meet-- the Himalayas, the Karakorams, and the Hindukush. K2 (Mount Godwin-Austen) is the world's second-highest mountain peak. Visit the K2 Museum located in Skardu near the K2 Motel. Rock carvings Dating back to the 8th century A.D., a huge Buddha figure surrounded by small Buddhisatvas is carved on a rock, three kilometres from Skardu, across Sadpara Nullah on the Skardu-Sadpara Road. Pre-historic men and animal figures are carved on rocks alongside Kachura Lake. Some rock carvings and the diagram of a monastery near Perkuta (Mehdi Abad) Nalah are also found. Punial Sherqilla is the main village of the picturesque Punial Valley.One of the largest villages in surface area is Hatoon. Singal This spot in the Punial valley offers ideal trout-fishing opportunities. Rama A lake in this region offers an awe-inspiring view of the eastern side of Nanga Parbat, 8126 meters high. For the adventure-loving tourist, hiker, angler, art lover, mountaineer, or polo enthusiast, there are few places in the world that can compare with Gilgit. Gilgit-Baltistan covers an area of 72,971 km² (28,174 mi²) and is highly mountainous. The administrative centre of Gilgit was an important city on the Silk Road, through which Buddhism was spread from India to the rest of Asia. A large number of Buddhist Sanskrit texts, including the long version of the Heart Sutra have been unearthed in Gilgit. The Dards and Cizinas also appear in many of the old Pauranic lists of peoples, with the former finding mention in Ptolemy's accounts of the region. Two famous travellers, Faxian and Hsuan Tsang, are known to have traversed Gilgit as per their accounts. Gilgit was ruled for centuries by the local Trakane Dynasty, which came to an end in about 1810. The area descended into internecine turmoil before being occupied by the Sikhs in 1842. It was ceded to Jammu in 1846. Gilgit's inhabitants drove their new rulers out in an uprising in 1852. The Khushwakhte Dynasty of Yasin and Gulapure led the people of Gilgit to drive out the Dogra rulers. After Yasin was conquered by the Katur Dynasty of Chitral, the power of the Khushwakhte was crushed. The rule of Jammu was restored in 1860. Gilgit came under British rule in 1889, when it was unified with neighbouring Hunza and Nagar in the Gilgit Agency. When British rule came to an end in 1947 and British India was granted independence and divided into India and Pakistan. However, the British failed to negotiate the freedom of independent states, who signed a treaty with the British, like Jammu and Kashmir, Hyderabad, Junagadh, Swat, Balochistan etc. So, Maharaja of Jammu and Kashmir, Hari Singh reigned over the region and claimed it to be independent of the two nations. In 1947, a tribal uprising which led to Indo-Pakistan war of 1947 took place and Hari Singh joined the Indian Union. However, following the tribal uprising the state of Jammu and Kashmir was divided and the region came under Pakistani control. The region is claimed both by India and Pakistan and is termed as the Kashmir conflict. Gilgit-Baltistan is divided into three divisions--the Baltistan Division, Brooshal Division and the Diamer Division--which together comprise ten districts. Skardu town is the administrative center of the Skardu District. Askole is the last settlement in the district for all treks to Concordia (the confluence of the Baltoro Glacier and the Godwin-Austen Glacier). Skardu is the district where the Indus River enters the Northern Areas from the Indian state of Jammu and Kashmir. The Ghanche District is the easternmost district of Baltistan. To its east is the Leh District of Ladakh, northeast is Aksai Chin, (China), to the north and northwest is the Skardu District, to the west is the Astore District, and to the south is the Indian state of Jammu and Kashmir. The administrative center of the Ghanche District is Khaplu. The Hushe valleys form the gateway to the great Baltoro Muztagh, a sub-range of the Karakoram. The Astore District was recently carved out of the Diamir District. Previously, the Northern Areas was divided into five districts. The administrative center of the Astore District is Astore town and it includes many villages in the Astore valley. The Astore District is bounded by the Diamir District to the west and the Skardu District to the east. The Diamir District is the district where the Karakoram Highway enters the Northern Areas from Pakistan's North-West Frontier Province. Chilas is the administrative center of the Diamir District. The Diamir District is bounded by the Astore District to the east, Pakistan's North-West Frontier Province to the south and southwest, the Ghizar District to the north and northwest, and the Gilgit District to the north and northeast. The Ghizar District is the westernmost district of Gilgit-Baltistan. It is bound by Pakistan's North-West Frontier Province on three sides (north, west, and south), by the Diamir District to the south and southeast, and by the Gilgit District to the east. A small strip of Ghizar District (roughly 35 x 12 km) is sandwiched between the North-West Frontier Province and the Wakhan Corridor of (Afghanistan). Gakuch is the administrative center of the Ghizar District. Sherqilla is the most famous town, being the capital of the Rajas of Punial and Ishkomin. It is still a tourist spot with many attractions like trout fishing, treking and natural swimming pools. The Gilgit District is bounded by the Wakhan Corridor of (Afghanistan) to the north, the Xinjiang autonomous region of (China) to the north and northeast, and the Skardu District to the south and southeast. Gilgit town is the administrative center of the Gilgit District. Gilgit is one of the two major hubs for all mountaineering expeditions to the peaks of the Karakoram and the Himalayas. The Hunza-Nagar District is a newly formed district which was previously part of the Gilgit District. The district encompasses the Hunza and Nagar valleys. 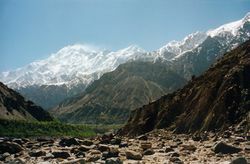 The major town is Karimabad (actually a grouping of five to six smaller villages), surrounded on all sides by glorious mountain peaks, foremost amongst which is Rakaposhi. The Nagar Valley and the Hoper Glacier are situated a dizzying 40-minute drive from Karimabad, nestled below Golden Peak. Hunza is approximately 100 km from Gilgit, and is the last major town along the Karakoram Highway before entering China. Urdu is the national language of Pakistan and is spoken throughout Pakistan and in Gilgit-Baltistan as a lingua franca. The Local languages are Shina, Balti, Khowar, Wakhi, and Burushaski, As in Pakistan, itself, English is widely spoken among the educated classes and among those involved in the tourist industry. Arrive in Islamabad. Pakistan International Airlines offers daily flights between Gilgit and Islamabad. The flying time is approximately 50 minutes, and the flight is one of the most scenic flights in the world, as its route passes over Nanga Parbat, where the mountain's peak is higher than the aircraft's cruising altitude. PIA also offers regular flights on Boeing 737s between Skardu and Islamabad. All flights, however, are subject to weather clearance, and, in winters, flights are often delayed by several days. The Karakoram Highway, once a minor Silk Road route, connects Islamabad to Gilgit and Skardu, which are the two major hubs for mountaineering expeditions in Gilgit-Baltistan. The journey from Islamabad to Gilgit takes approximately 20-24 hours. Landslides on the Karakoram Highway are not uncommon, but bulldozers usually clear the road in a short time. The KKH connects Gilgit to Taxkorgan and Kaxgar in Xinjiang, China, via Sust (the customs and health-inspection post on the Pakistan side of the border) and the Khunjerab Pass, the highest paved international border crossing in the world at 4,693 metres (15,397 feet). NATCO (Northern Areas Transport Corporation) , Silk Route Transport Corporation, and several other transport companies offer bus and jeep transport service to the two hubs and to several other popular destinations, lakes, and glaciers in the area. Eighteen of the fifty highest peaks in the world are located in Gilgit-Baltistan. K2, 2nd-highest peak in the world at 8,611 m.
Gasherbrum I, 11th-highest in the world at 8,080 m.
Broad Peak, 12th-highest in the world at 8,047 m.
Gasherbrum III, 15th-highest in the world at 7,946 m.
Gasherbrum VI, 17th-highest in the world at 7,932 m.
Distaghil Sar, 19th-highest in the world at 7,884 m.
Khunyang Chhish,21st-highest in the world at 7823 m.
Masherbrum ,22nd-highest in the world at 7,821 m.
Batura Sar, 25th-highest in the world at 7,795 m.
Kanjut Sar ,26th-highest in the world at 7,788 m.
Rakaposhi, 27th-highest in the world at 7,760 m.
Saltoro Kangri, 31st-highest in the world at 7,742 m.
Chogolisa, 36th-highest in the world at 7,498 m.
Shispare, 38th-highest in the world at 7,611 m.
Trivora, 39th-highest in the world at 7,577 m.
Skyang Kangri, 44th-highest in the world at 7,545 m.
Three of the world's seven longest glaciers outside the polar regions are located in Gilgit-Baltistan-- the Biafo Glacier, the Baltoro Glacier, and the Batura Glacier. The Siachen Glacier is 75 km. long. The Hispar (53 km) joins the Biafo at the Hispar La (5154.16 meters or 16,910 ft) to form an ice corridor 116.87 km (72 mi) long. The Batura, too, is 58 km in length. The most outstanding of these rivers of ice is the 62 km Baltoro. This large glacier, fed by some 30 tributaries, has a surface area of 1291.39 sq km. There are several high-altitude lakes in Gilgit-Baltistan. Karakoram Air Safari is the most scenic air journey starting from Islamabad by Pakistan International Airlines. Mountaineering, Trekking, and Hiking: The area is ideal for mountaineering, trekking, and hiking. Permission for mountaineering and trekking in the restricted zone is issued by the Ministry of Tourism, Government of Pakistan, Pakistan Sports Complex, Kashmir Highway, Aabpara, Islamabad (Telephone: 92-51-9203509). Fishing permits are issued by the Fisheries Department at Gilgit and Skardu. Fishing: at Satpara Lake (8km) and Kachura Lake (932km) from Skardu, abound in trout. Fishing permits are issued by the Fisheries Department. Flora and Fauna: Roses, lilies, pansies, willow, pine, and fir trees are found in abundance. Apples, apricots, peaches, plums, mulberries, walnuts, and grapes are available from June to October and almonds from October to March. Wildlife: Baltistan boasts of wildlife such as markhors, ibexes, snow leopards, and birds, namely chakors, partridges, and ducks. Most of the animals and birds are protected, but limited shooting is allowed. Hunting permits are issued by the local administration. Polo Attend the Shandur Polo festival. Most of the best restaurants are located in hotels. Cafe De Hunza is located in Hunza Valley. Pagoda Restaurant offers Chinese cuisine. The Pagoda is on an island in Honeymoon Lake and is linked to the Shangrila Resort by a short bridge. The Lake View Restaurant gives a panoramic view of the Shangrila Resort and offers Pakistani and continental cuisine. Tandoori Village offers a taste of ancient recipes--chicken tikka, seekh kababs, mutton tikkas, and grilled fish with home-made tandoori roti. Enjoy an outdoor feast under the stars in a traditional atmosphere. Cafe DC-3 The original code name of this DC-3 aircraft was Alph Alpha Foxtrot (AAF). This unique cafe is housed in an airplane which crash-landed on the riverbed and was brought to its present site back in the 1950s. It offers a variety of snacks and cabin-crew hospitality. Bars are located in most of the top end hotels. Avoid drinking tap water. Locals usually drink water coming from a stream, but that can be unsafe for some people due to its minerals content. Drink only bottled water, which is readily available everywhere. Security-wise, Gilgit-Baltistan is considered to be one of the safest regions under Pakistani control, but some parts of it are off limits to tourists, especially the buffer zone along the "Line of Control" that divides the Indian- and Pakistani-controlled parts of Kashmir. Avoid venturing close to the LoC, as it could put you in trouble with both respective authorities. District Headquarters hospitals are present in Gilgit, Skardu, Khaplu (Ghache District), Chilas (Diamer), and Ghazin (Gahkuch). Mobile services are available in the area. To China: Thrice-weekly bus service was scheduled to begin crossing the border from Gilgit to Kashgar, China, and road-widening work was scheduled for 600 kilometres of the Karakoram Highway. There were also plans for one daily bus in each direction between Sust and Taxkorgan in the border areas of the two countries. To Islamabad: Via the Karakoram Highway, popularly known as the Silk Road. To India: The Srinagar-Muzaffarabad route and Wagah borders will allow you to visit India while the Kargil-Skardu road is closed. Pakistan International Airlines offers daily flights between Gilgit Airport and Islamabad International Airport. The flying time is approximately 50 minutes, and the flight is one of the most scenic flights in the world, as its route passes over Nanga Parbat, with the peak of the mountain being higher than the aircraft's cruising altitude. PIA also offers regular flights on Boeing 737s between Skardu and Islamabad. All flights, however, are subject to weather clearance, and in winters, flights are often delayed by several days.